This issue, we sit down with Josh Rood, one of the founders of Óðrœrir, a Heathen journal dedicated to scholarly, peer-reviewed articles. A musician with the band Fenrismaw, and actively involved with the East Coast Thing, Rood here discusses what lead to the creation of Óðrœrir, the importance and viability of Heathen traditions, and some surprising discoveries he made after setting out on a Heathen path. Eternal Haunted Summer: If you could correct one common misconception about the Northern Tradition/s, what would it be? While one of these is more obvious than the other, I believe they still stem from the same misconception. The ancient customs, traditions, and religions of the preChristian Germanic people are viable in the modern world without “reinterpreting” them. Yes, some things are outdated, and some things are no longer possible. For example, we know that human sacrifice existed, and we don’t plan on bringing back that practice, but we do want to understand why it existed, so that we can understand the socioreligious implications, and work from them. So yes we do adapt what we learn of the old heathen religions to a modern setting, but we do it from an understanding of their original context. If we throw out all context, essentially the “baby with the bathwater” and try to “reinterpret” the “northern traditions”, then we don’t really have a northern tradition, and the Old Ways would still be dead. As for the idea that that the religion itself is outdated because of certain heathen practice are no longer viable, I can point to the fact that pilgrimage is no longer a very Christian concept, and Jews no longer practice animal sacrifice. However they still retain the worldview that those practices stemmed from. It would be naive to believe that a people as adaptable and versatile as the heathen are incapable of adapting their indigenous religion. EHS: How would you describe your own spiritual path? JR: I strive to retain and build the renown and the luck of my family and close community, through my actions and the actions of my kindred. I comply with the thew of my kindred, and I strive to strengthen our social bonds. At holidays I give sacrifice to the gods, as a way of reaffirming those bonds that we have as a community which includes those people, ancestors, the land that we celebrate on, and the gods, including local wights which are a part of our innengard. I maintain a gifting relationship with my kindred, my friends, and the gods, in the hope that all of them repay me with luck, support and help in this life, and I hope that when I die, my children, family, and the greater community remember me fondly and that I’ve helped put them in a stable and healthy position in life in which they can carry on our traditions and customs, and be equally or more successful in their own lives. EHS: As one of the editors of Óðrœrir, could you give us some background on that journal? First, how and why was the name Óðrœrir chosen? JR: Óðrœrir is really the result of many many discussions, and an overall feeling that developed over the course of a few years amongst a particular community of heathens. I think the seeds of that go back even farther, to the beginning of what is for some reason being known as the “reconstructionist movement.” We realized that for our brand of heathenism, there were no sources for people new to heathenism, or who are interested in heathenism the way that we see it. 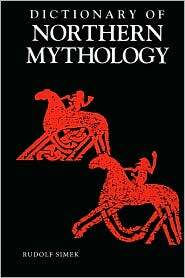 That is to say, someone would tell us that they are new to heathenism, and ask what they should read, and we would point them to Terry Gunnell, or Simek’s Dictionary of Norse Mythology. I’ll be the first to admit, scholarly works can make a person’s eyes glaze over, and a lot of people don’t have the time to essentially earn a Master’s degree in their free time in order to be a heathen. We felt that a lot of published works that were for sale at the time were not an accurate depiction of heathenism, at all. Most were heavily influenced or actually written by Wiccan authors, and many of those that were not, were still not the same sort of heathenism that we practiced. Now there is nothing wrong with Wicca, and there is nothing wrong with neo-paganism, or mainstream Asatru. But It isn’t what we are, and it gets frustrating when you want to point someone to a book to help them understand what you do, but there is none. So as I have heard said before, “Sometimes you need to write the book you want to read.” We wanted something out there to represent US and that is written by us, for people to read, if they happen to be looking. EHS: Óðrœrir is described as a journal “dedicated to developing, fostering, and distributing scholastic literature solely regarding the reconstruction of the various pre-Christian religious traditions and cultures of Northern Europe.” What led to the focus on scholastic literature? JR: It really simply boils down to the fact that we strive to develop and grow as heathens in a manner that is consistent with historical heathenism, and some of us have done a lot of research in that field, and we feel it’s only appropriate to fact check, and fact check again, and to cite all of our sources, and compare and contrast our research. Our review board is actually made up of several people who are involved in greater academia (we keep them anonymous to respect their privacy). It’s their job to rip us apart if we are trying to publish something that is inaccurate. In just my paper there were a few things that I was not actually correct about, and I was told to go back and fix it. If we are engaged in reconstructing ancient religions, we do not do those religions any justice by putting out faulty information. On that note, it’s still a heathen journal. It’s not a compilation of thesis papers. We aren’t working under a grant or for a University of Heathen Studies (though some of us are engaged in that field). So if we want people to be able to contribute, we need to be a little lax on writing style, presentation, and so forth. Our big concern is making sure that we’ve got our facts straight, but that’s a lot more difficult than one might think. We’re not just making sure dates and names are correct. We’re getting checked to make sure that our own understanding of heathenism is correct. That can be a bit humbling, but I think it’s very fruitful. I found that some of my own concepts regarding the nature of “Sacrifice” were wrong, and that I was looking at it from an outsider, modern … while I hate to admit it … Christian perspective. I was corrected and given plenty of sources to secure a more proper understanding, and now I’m not only happy that I have a better understanding of that concept (and therefor I am applying my new understanding to my own practice and life), but I’m happy I didn’t publish something that would mislead people. EHS: What are some really good examples of scholarly literature? What’s on your Must Read list? JR: Well one of my favorite books is James Russell’s Germanization of Early Medieval Christianity. It talks a great deal about worldview, and points to how Christianity was able to establish a foothold, and grow in Hellenized Rome, and why it was unable to spread so easily through Germania. I think to newcomers, this book does a great deal of stressing that religion is not just a matter of changing “belief” or “knowledge”. I also think that Simek’s Dictionary of Northern Mythology is a must own. I read it cover to cover, despite it’s being a dictionary. EHS: For Óðrœrir, what falls under the term “Northern Europe”? Scandinavia only? Or would people interested in Eastern Europe and Russia and the British Isles and Ireland also find Óðrœrir a useful resource? JR: We are sincerely hoping that we can get other “heathen” groups to contribute. The Germanic people were not the only people in Northern Europe to be called heathens. 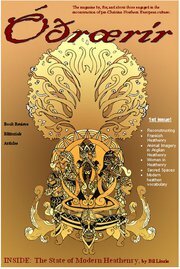 We’re hoping we can get some of the Lithuanian and other Baltic, Slavic, Finnish, even Celtic groups to use our journal. Those of us who are currently on the team cannot contribute to this however, as we are all some variation of Germanic. We are offering to give slots in the journal to these groups, and we really hope to see them involved, but we need them to be the ones to step forward. EHS: Óðrœrir is also aimed at people interested in the “reconstruction” of ancient, pre-Christian traditions. How might people attempting to reconstruct *any* ancient faith filter out or plow through or overcome that dominant, Christian worldview? JR: The first step is understanding that we do have a dominant, Christian worldview. But we also have a worldview shaped by what our parents taught us, our high school experiences, our love lives (or lack thereof). How many times have we believed something was true, and maybe shaped our behavior around that belief … until we realized we were wrong? Hell, this could be something as simple as utilizing a game strategy, and finally realizing some pattern or truth that makes you change your strategy, and come to a different conclusion. It’s hardly ever conscious, but we shape our worldview through our experiences and through what we hear or learn or witness as well. JR: There is indeed! I may be biased, living in NY, but I believe the northeast US has the best brewing community in the world. We’re going to get some of these phenomenal brewers to talk about their craft, and what it means to them, and to heathenry, and yes, we’re going to include recipes. EHS: Is Óðrœrir open for submissions? If so, is there anything in particular you are looking for in a submission? JR: It is. We will be putting into our news feed what “new sections” people can submit to, with information on them. For example, we want a prose section that will have short stories. If people wish to contribute to the actual article section, they will need to follow the guidelines that we put up on the website. Basically, they’re going to have to really really research their topic, put it into the format we ask for, and expect that they may get it sent back with corrections that should be made. As I said before, this isn’t to discourage, but to really help us all in the long run. I really hope people submit articles, and I know a few have already asked if they can. EHS: Where can interested folks find Óðrœrir? JR: You can search us on facebook, but you can also go to the website. The journal is 100 percent free. EHS: Do you have any advice for others who might be considering starting a journal? Things they should definitely do? Mistakes to avoid? JR: I would say you need to really take your time. Don’t give a release date until your certain you can hit that date … we gave about 3 unfortunately … and had to keep pushing it back. It takes a lot of work, but you should never cut corners. Also, I would say not to just put out a journal unless you feel there is a real need for it. Is it lacking in the public circle? We put ours out because we wanted to read a journal like it but couldn’t find one, so we all collaborated on helping to get it out there. JR: I’ve got my music project that I’m engaged in. It’s a death metal band named Fenrismaw. People can check that out if they like. I’m always working on something heathen. At the moment I’m building a protective ve for our kindred’s Odin idol. I’m hoping it will resemble a hall or a stave church, but will be able to be taken down and put back up fairly easily, and is just big enough for the idol, but can protect it from the elements. EHS: Which book fairs, conventions, or other events will you (or anyone with Odroerir) be attending in the foreseeable future? JR: I personally do not go to book fairs, or pagan conventions. I’m not sure about the others. I do go to the East Coast Thing every year in Pennsylvania, and currently my kindred is helping to run it, so that’s another big project that I’m engaged in. shameless plug here, make sure to check out my article in the journal on Groves and Sacred Spaces..
Great interview, but then again I knew it would be. Josh is one of the people I truly respect in modern Heathenry and is a great person to represent where we’re coming from. There was no answer given to “how and why was the name Óðrœrir chosen?” – FYI, it’s explained in the “From the Editor” piece on page 5. 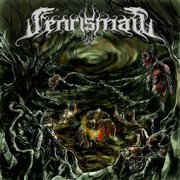 Fenrismaw rules, they are the best death metal band I’ve heard in at least a decade!!! !